As the teams entered the field of play at Harlaw Park, a crescendo of fireworks exploded overhead. This summed up the efforts of the local community to make this match a spectacle: shops were decorated in the main street, the players were treated to a civic reception the night before the game and Inverurie Locos’ hospitality suite was crammed prior to kick off. A healthy crowd hoped to see fireworks on the park as well as in the cool evening air in Aberdeenshire. Scotland kicked off and clearly had this intent in mind. Almost immediately Ross Smith’s left footed delivery was spilled by the English goalkeeper Sam Tickle, but with the crowd expectant, the number one dived bravely to smother the ball at the second attempt. England launched their first potent attack with eight minutes on the clock. An excellent advantage was played by refere Graham Beaton after Christopher Stafford had clattered into James Dickson in the centre circle. Isaac Sinclair picked up the loose ball and shifted it quickly to the pacy Owen Windsor who looked dangerous on the left. The wide-man’s driven cross evaded everyone in the area and passed out of play for a throw-in. England regained possession almost immediately, and there followed some nervous moments in the Scotland penalty area: Jamie Thompson blocked Josh Storey’s shot as far as Rob Melia, who was fouled by Josh Doig on the right side of the field. Ben Greenwood’s resultant cross allowed Storey to find Ethan Cartwright but a combination of Stafford and Ben Cameron were able to clear. This passage of play served notice of the visitors’ determination to take the game to Scotland at every opportunity. This aggressive approach gained reward in the 13th minute. A promising run by Dickson saw him confronted by a posse of defenders. He slipped the ball to Windsor, who struck a powerful shot from 20 yards against the post and into the back of the net for an excellent opener. Scotland were stung by this, and tried to gain a foothold in the play through keeping more possession of the ball, with skipper Jack Hodge at the heart of this strategy. Hodge’s opposite number Levi Tarbottam had to look lively after 20 minutes of play when a fluent move involving Cameron, Finlay Baird, Lyall Cameron and Josh Mulligan allowed Ben Cameron space on the right touchline in an advanced position. The full back’s testing cross was very well defended by the English captain close to his own goal, with a number of blue jerseys ready to swoop. Still England sought to probe. Dickson’s free kick was cleared by Owen Andrew as far as Cartwright, who had a speculative pop from 40 yards which flew over the crossbar. More dangerous was the combination between Melia and Dickson, but Scotland goalkeeper Lee Herbert was swiftly off his line to grab Dickson’s low centre as Isaac Sinclair looked interested. With 10 minutes until half time Harlaw Park was on its feet as Scotland almost equalised. There appeared to be little danger to the English goal as Mulligan picked up the ball just inside the English half on the right. With languid fluidity he glided past three opponents and approached the penalty area. His lofted shot cannoned off the crossbar and behind for a goal-kick. Small margins: England’s opener struck the post and inched over the line. Scotland were well on top now, and continued to attack as the half neared its conclusion: Hodge delivered towards Stafford in the English box, but the centre-half was crowded out by a gang of opponents; Mulligan tried to play in Lyall Cameron, but his pass was just too strong; and Hodge took the bull by the horns and rifled in a shot, but it finished narrowly wide. Scotland made a half-time substitution as Finlay Robertson replaced Josh Doig on the left hand side. The first ten minutes of the second period was mainly a midfield battle, with neither side able to fashion an opportunity of note. Goalscorer Owen Windsor appeared desperate to change this pattern. His enterprising run in-field from left to right saw him slip a perfectly weighted pass to Ben Greenwood on the edge of the area. His left foot shot clipped the top of the crossbar. Greenwood struck the crossbar again two minutes later with a bending corner. The rebound fell to Dickson, who saw his goal-bound shot athletically cleared off the line by Mulligan, straight in to the arms of goalkeeper Herbert. There then followed a sustained period of Scottish possession, as the home side sought the equaliser that the majority of the crowd desired. Hodge struck a free-kick narrowly wide of the target; Mulligan’s slaloming run found substitute Robertson on the edge of the area, but his shot was saved by English goalkeeper Tickle, before Mulligan drove into the penalty area and shot over. Hodge then found Lyall Cameron who teed up the freshly introduced Tiwi Daramola in the box. Daramola (who had replaced Owen Andrew) saw his shot blocked by Owen Taylor; whilst clever play by Ben Cameron set up Mulligan for a strike which was just off target. 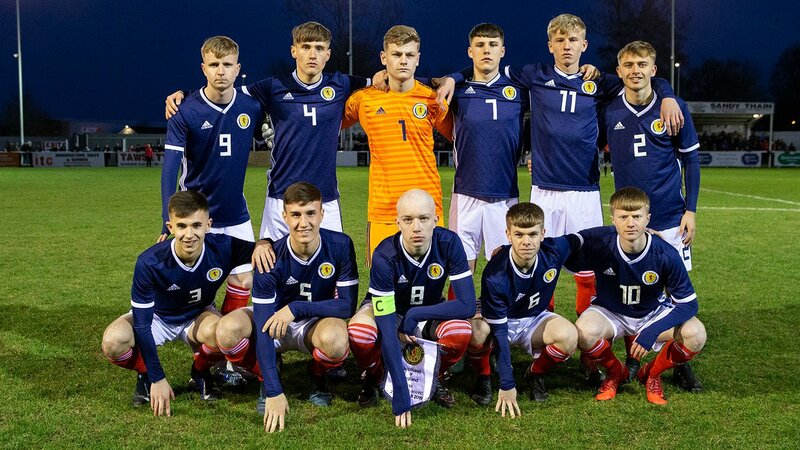 Scotland also made a change: Josh McConville replaced Finlay Baird, who looked to have picked up an injury after a hard-working 73 minutes in the midfield engine room. Four minutes after Baird’s departure, goalkeeper Lee Herbert kept Scotland in the match, saving with his foot from Greenwood who looked to cash in on Windsor’s superb crossfield pass. This was to prove Windsor’s last involvement of the evening, as the English goalscorer was replaced by Adam Crowther with seven minutes remaining, as Scotland also swapped Wilson Romanis for Lyall Cameron. In between times Herbert had performed heroics again, denying substitute Arbor as he sought to steam in on goal. Arbor would not be denied, and when Scotland pushed almost everyone forward in the 92nd minute to try to force an equaliser, he and fellow substitute Richardson combined on the breakaway to carry out the classic sucker-punch: Arbor finishing with a powerful right foot shot into the roof of the net. England’s cheers spoke of a mixture of delight at the goal, and relief – for Scotland had had the bulk of the play in the second half, but, sadly nothing to show for it in an entertaining game which the hosts in Inverurie richly deserved. SCOTLAND Herbert, B. Cameron, Smith, Stafford, Thompson, Baird, Mulligan, Hodge (c), Andrew, L. Cameron, Doig. Subs: Robertson (for Doig 45’), Daramola (for Andrew 67’), McConville (for Baird 73’), Romanis (for L. Cameron 83’). Unused subs – Heraghty (gk), Coll, Meekison. ENGLAND: Tickle, Melia, Cartwright, Tarbottom (c), Taylor, Johnstone, Sinclair, Windsor, Storey, Dickson, Greenwood. Subs: Richardson (for Sinclair 70’), Arbor (for Johnstone 70’), Crowther (for Windsor 83’) Unused subs: Martin, Rule.